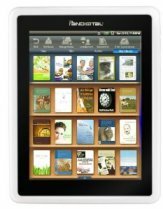 If you�re thinking about buying a new eBook reader device - or have already purchased one - then you may also want to take a look at some of the many accessories available. Some provide great ways of taking care of your reader, and some are just for fun! Now that you�ve spent a good few hundred $$ on your new eBook reader, you�re probably going to want to prevent it against any damage to ensure you get your money�s worth. One of the simplest ways of doing this is to buy an appropriate eReader cover for your device. There are many different manufacturers to choose from. If you own a Kindle, then you can buy direct from Amazon, but there are also covers for the Sony Reader and more. Charges are a perfect accessory for your new eBook reader device. Not all eBook readers (including Kindle) come with their own mains charger, and are charged by plugging them into your PC or Mac. This may be acceptable, but there are also occasions when you may need a charger for the mains. These are, again, available from a number of suppliers - and in international formats if, for example, you are buying a Kindle and shipping it to the UK. Reading lights have already become popular for use with the Kindle, making the reading experience even more enjoyable. These are personal lights that can be clipped onto your reader and are perfect for those who want to read in bed but don�t want to disturb a partner. Remember - your reader won�t light up itself in the dark due to its natural e-Ink technology, which is why these lights are so useful. If you have an Amazon Kindle then you can take advantage of some of the fun and funky protective skins designed to keep your Kindle free of scratches - as well as helping you to personalize the device. These are simple vinyl skins that come in a variety of designs, and are some of the cheapest eBook reader accessories available on the market. Great for gifts for anyone who already has a Kindle! We will probably also see these become more and more common for other eBook brands in the future. As you can see, there are so many options for cool and practical accessories for your eBook reader device - and more and more are becoming available all the time.